Backyard sauna - build you own sauna or buy one? Many people who have their own house at some point think about building a sauna on their property. To have a happy place, where you can have a good time, to relax and to get warm on cold days. This is a great desire and awesome that you want that. Majority rejects this idea as soon as they grasp that you need much money and precious time to make this come true. Also this changes the view of your backyard. Of those who still took this step, there are people who stop half way. And we do not judge. Since not all get to estimate the full scope of work before construction. And during the process of work you can be surprised how much costly it is in all senses. Some hire a constructor to not bother himself with all the work, but it increases the sauna budget by an average 50%. Some buy ready kits, but they are prebuilt and the design is sometimes not how you wanted your sauna look. 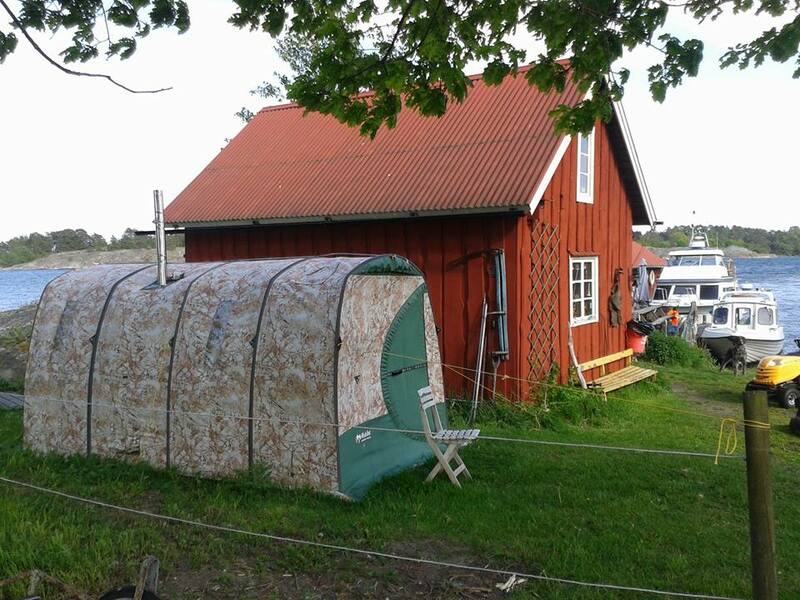 We propose a slightly different approach to the sauna in the backyard - a Sauna Tent. This is the real sauna, but for a different price. The construction of wooden sauna, or the purchase of sauna kits you will spend a minimum of 4000$. And if you need a bigger version, which will fit 6-8 people - it is still a lot of money. Sauna Tents starts with 500 dollars, and the largest ine, which can accommodate all the relatives and neighbors, worth 3000 dollars. Since the tent sauna walls are made of cloth, the tent itself does not take up much space. Tent fits in two bags - one for the tent and the other for the wood heater. Major plus of this sauna - you can take it anywhere. Weight of the set such as The Walrus, is only 26 kg (57 pounds). This sauna can also be used in the back yard and in the garden and country house. So that instead of building a sauna everywhere you stay - you can "carry" it from place to place. During the construction of a wooden sauna, you need to take into account many factors that affect the retention of heat in the steam room and your safety. A Sauna Tent has already everything ready. The fabric of the tent is very dense and heater is powerful enough, so is very hot in this kind of sauna. Temperature easily reaches 100C (230F), even in winter. The fabric has a special impregnation, which makes it fireproof - it does not burn, but melts. And to burn that fabric you need to make an serous effort. The furnace has an integrated spark arrester, which does not allow sparks on the wall or on the roof of the tent. Steam Room and Lounge Room. We understand that sitting in the steam room for a long time is exhausting and you want to rest at some point. Therefore, our tents have special partitions that divide the tent into two compartments. In one you are taking a steam bath, and other is for relaxing. If you have a small tent (The Walrus / The Walrus Light), you can man up an additional tent-cover, which will create additional room and transform your tent in the double-layered. The second layer will help keep the heat in the sauna longer, due to the air gap between layers. Our tents fit different use. Use it as a camping tent - it is possible to live there a long time. If you replace the sauna heater on the long burning one - you get a tent in which you can live comfortably in extreme conditions and in any weather. Also this tents can be used as rehabilitation centers, for the rescue workers etc.